Got seriously behind with this – sorry. So four weeks in one. The plastering – and odd bits of plasterboarding/tacking – press steadily on. This is taking very much longer than originally expected, largely because there’s only one person doing the work – a subcontract disagreement issue which is nothing directly to do with us. But it does mean that we are at least a month behind schedule. Nevertheless, the kitchen and dining room have been painted (by us) and I have put up all the electrical sockets switches and lights (some of these lights are really awkward to wire, particularly if you have 2 in parallel) in the kitchen, dining room and utility room so far. The stove is installed and has been joined to its flue (together with some discussion about what was, or was not, vertical. The second-hand red brick alcove in which the stove sits has joints which are not perfectly in line). As reported earlier all the windows are in place and we have a date for delivery of the front door. 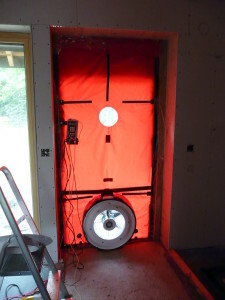 This has meant that (even without the front door) the air test can been performed. I haven’t seen many Grand Designs, but I do remember one where the architect/designer was skipping for joy because she’d achieved a really good, better than Passivhaus standard figure. Well, so have we : 0.5 ach – which stands for airchanges an hour. This is good news, quite apart from the satisfaction of knowing that Touchwood Homes have achieved what is said on their signboard at the drive entrance! 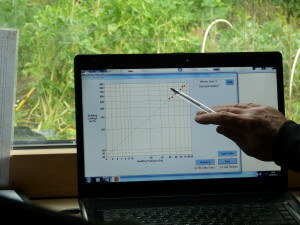 Combined with the known performance of the highly insulated walls, a really low energy requirement is confirmed. There’s a discussion which led to some telephone calls between me and the air test people and the assessor who was being asked to produce the Energy Performance Certificate. The usual way of meauring air tightness in this country seems to be in volume (of air leaked) per unit area of building external surface (square metres) per unit time (hours) at a given pressure (50 Pascals) – and the result we got was 0.68m³/h.m²@50Pa. Set against this was the desire to meet the Passivhaus standard of 0.6 ac/h. But ac/h depends on the volume of the house, not the surface area, so to find out whether we’d met the standard it was also necessary to calculate the volume. For a house of this sort, setting off to meet Passivhaus standards is going to be good start, simply because of the low space heating demand it implies. The external cladding (there are references to the cladding, in rebated Thermowood weatherboard, elsewhere) is finished as far as it can be, while we wait for the delivery of the front door. This has proved difficult to source. We – well, I – wanted a pretty substantial one which, from the very earliest version of the specification I’d written, was to be a “Tilling” front door. This is a foolish literary allusion, so I’d had to include a footnote (in a Terry Pratchet manner (see the Discworld novels)) which explained that Tilling is the town in which some of E.F. Benson’s Mapp and Lucia novels are set. But Tilling is actually Rye, Sussex, of which Benson was some time mayor. Visit old Rye and you will see many of the magnificent Georgian front doors. As explained elsewhere, this house is a modest, not a grand, design – so it needs a few features to give it presence, and an impressive front door should help. But to get a door this big that also meets Passivhaus standards at a bearable price has not been easy and Peter Smithdale of Constructive Individuals has spent some time canvassing, even badgering, manufacturers to see if this could be achieved. It should arrive 2nd week in July. Receiving the EPC allows the Feed-In Tariff application to be completed. From 1st April an EPC is required to show that the building is sufficiently energy efficient to be worthy of consideration. “D” is required – this house is at the top of “A”. So at last I should begin to get paid for the electricity the solar PV has been generating since the end of March. Even in the poor weather of this summer it has already generated over 1300kWh. Later update – I didn’t; they were in error all over apologies, but . . . . No backdating, so I am unpaid for the period until they received the EPC. Miffed! I’d better publish this before it becomes irrelevant – and get on with the next instalment. Oh yes. Comments are welcome – but links to advertising websites will simply be deleted! This entry was posted in Cladding, Electrics, Solar PV, Ventilation, Windows. Bookmark the permalink.